The Cobra XRS 9730 is a 12 band? radar detector featuring Cobra's Xtreme Range Superheterodyne? Technology. With this new technology, the Cobra XRS 9730 has even more range than past Cobra models. The Cobra XRS9730 model also provides voice alerts-and includes a built-in 8 point digital compass. The Cobra radar XRS 9730 is also equipped with an alpha numeric display, which allows for far more detailed detection messages and a more complex signal strength indicator. The intuitive IntelliMute? feature is also included, and will automatically mute the Cobra radar detector based on your speed. The Cobra detector radar responds to all types of radar currently in use by police, and provides 360 degree detection of all types of laser guns laser. The XRS-9730 also provides detailed messages from Cobra's exclusive Safety Alert? and Strobe Alert warning systems. This Cobra detector radar is immune to the VG-2 and Spectre I radar detector detectors, and provides alerts when VG-2 and Spectre I are in use. Cobra's Strobe Alert will alert motorists to over 50,000 emergency vehicles equipped with strobe transmitters that activate red lights at traffic intersections in emergency high speed situations. Call your local Fire/Police department for your area coverage. X X X X Ultra Performance Extra detection range provides advanced warning. X X X X POP Mode Detection Detects the latest Radar Gun Pop (Super-fast Instant-On) Mode. X X X X X X X Ku Band Detection Detects Ku Band Radar Gun currently being used in Europe. Be ready when it comes to U.S shortly. X X X X X X X IntelliMuteTM Relative speed sensing auto mute system that virtually eliminates false alerts. X X X X IntelliShield? False Signal Rejection Reduces the frequency of falsing in densely populated urban areas. The city mode has 3 levels of setting for enhanced false signal rejection. X X X X 8-Point Electronic Compass Automatically provides an accurate electronic direction reading. X X X X X X X X Multi-Band Detection Detects all radar signals listed in table below. X X X X X X X Strobe Alert? A Cobra exclusive, works with tens of thousands of emergency vehicles currently equipped with traffic light controlling strobe emitters. Provides advanced alert of the presence and/or approach of these vehicles. X X X X Smart PowerTM Automatically shuts off power to the unit when ignition is turned off. X X X X X Voice AlertTM Provides the user with specific band voice annunciation. X X X X X X X X LaserEye? Provides 360 detection of laser signals. X X X X X X X X Safety Alert? Warns driver of emergency vehicles and road hazards from systems equipped with Safety Alert? transmitters. X X X X X X X X VG-2 Alert? Alerts the user when they are under surveillance of VG-2 radar detector-detectors. 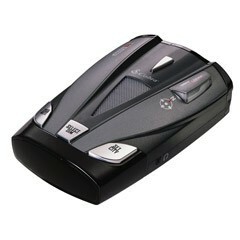 X X X X X X X X VG-2 Undetectable Provides complete immunity to VG-2 radar detector-detectors. X X X X X X X Spectre AlertTM Alerts user when they are under surveillance of Spectre 1 radar detector-detectors. X X X X X X X X Spectre Undetectable Provides complete immunity to Spectre 1 radar detector-detectors. X Full Color Extreme Bright DataGrafix DisplayTM Provides enhanced data display in easy to read vivid full color. Also allows user to select different color schemes. X Bi-Color Extreme Bright DataGrafix DisplayTM Provides enhanced data display in easy-to-read cool blue and yellow. X X X DigiView? Data Display Provides easily recognizable digital text display. X X X UltraBrightTMData Display Provides easy recognition of band detected by use of band identification icons. X X X X X X X X City/Highway Modes Allows the user to select operating mode, reducing the frequency of falsing in densely populated urban areas. X X X X X X X Digital Signal Strength Meter Provides the user with relative proximity to the target. X X X X X X X X Auto Mute Automatically mutes the alert tone for enhanced driver convenience. X X X X X X X Dim Mode Allows the user to dim the radar detector display enhancing night driving visibility. X X X X EasySetTMProgramming Menu User-friendly mode selection/setting with visual guidance. X X X X X X X Stay Set Electronic Memory Electronically remembers radar detector settings for an indefinite period of time even with the power removed. X X X X X X System Ready Prompt Notifies the user that the radar detector has correctly completed a self-test and is ready. X X Battery Voltage Display Provides awareness of battery condition. X X Low Voltage Warning Alerts user whenever battery voltage falls below 11.9 volts.